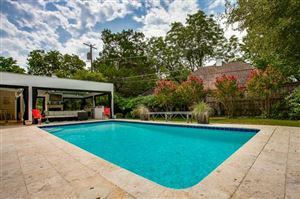 Located on green, tree-studded hills overlooking downtown Dallas, and bordered by the Stevens Park Golf Course, Stevens Park Estates is one of Oak Cliff’s gems. The homes were predominately constructed in the 1920s and 1930s, with development into the 1950s. Architecture is mostly English Tudor, Spanish Eclectic, and Colonial style, with some 1940s and 1950s ranch styles added. Inside, many homes contain original features such as leaded or stained glass, plaster walls, period light fixtures, and colorful Art Deco baths with pedestal sinks. Home sizes range from quaint bungalows to large estates, some with multiple sized lots. The Stevens Park Estates Homeowner’s Association was founded in 1981 and plans and hosts several neighborhood gatherings during the year. This involvement combined with stable property values and elegant homes make Stevens Park Estates as sought after today as it was in our grandparents’ generation. The area is now officially a Conservation Distrct.